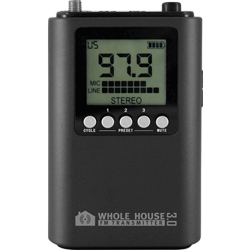 The Whole House FM Transmitter 3.0 broadcasts the music playing in your show to radios near your home. 150 Foot Range Broadcast 150 feet in all directions in rich, static-free audio. The Whole House FM Transmitter 3.0 reaches every corner of your house, yard, garage, office space and car. Adjustable Antenna The new 6.5″ swivel SMA antenna makes adjusting the angle and rotation easy, plus it’s reverse threaded and can be unscrewed for better storage. It’s sturdier too! Audio & Mic Volume Now you can use a microphone at the same time as any audio source, plus you can easily adjust the volume of each separately. Perfect for karaoke, tour guides, or translation. Four Power Methods With the USB power cord and free power adapters included in every box, you can power up with any AC wall outlet, 12v auto port, USB port, or “AA” batteries. Durable Case The all new sleek design is cast from a stronger plastic polymer to help safeguard against accidental drops, and is held together by stronger screw fasteners. Improved Interface A larger LCD and blue backlighting makes reading easier, and the interface controls are more flexible, giving you more control over every feature. The power output of the Whole House FM Transmitter 3.0 is designed to comply with FCC Part 15C, which governs the use of low power FM transmitters. The distance the FM transmitter can go will vary greatly on your environment and quality of FM Receiver so providing an exact distance for your situation is not possible. The transmitter is guaranteed to transmit a minimum of 150 feet.